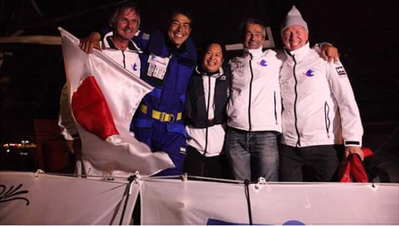 Kojiro's report at Concarneau after the New York Vendee finished. as of June 23. Hello, everybody of our team, I got to finish and completed the New York Vendee Yacht Race. So, I got the qualification for the Vendee Globe competing. Our team organized the boat only in two months and set off the Atrantic Ocean and came back, Those achivements are all thanks to their efforts and your supports. As the result, I could get the qualification. Now, the ship is landed on a stand frame and going to pull a mast and keel off for the inspection regarding to be able to join the Vendee Globe competion in November. I appreciate and thank you for your support to qualify. Our team still face a short budget to make equipments like sails to be new, so we need your continous support. I will go back to Japan once to report a current status. 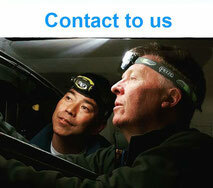 I want to proceed to the Vendee Globe with a completly satisfied condition, I want to keep familiarity with you. as of June 23 in Concarneau France. Kojiro's interview by Fuji TV (FCI-NY) through YouTube has been translated in English for "Team Kojiro Shiraishi Vendee Globe 2016~2017 Challenge" members. All copy right reserved by FCI-NY. Solo, Non-Stop, No Support, Around alone the World Yacht Race named the Vendee Globe 2016~2017 will start from France and end to France. In France, it's more watched than the Tour de France. According to its hard route, called the most extreme race in the world, that high class race will start in this winter. A lot of men who called the Skipper will gether in France (Les Sables d' Olonne) to climb the summit. Kojiro: I must have to keep a full complete running as the first Japanese competitor. In a last month, a final prerequisite race has been held in New York, and we covered the First Japanese Skpper who will challenge the Vendee Globe as the First Asian Sailor. An Ocean Explorer Kojiro Shiraishi, who had graduated from a high school, soon took the way to a yachting race life. and at only 26 years old, he completed a solo non-stop around alone the world yachting from Japan to Japan 176 days and got the record as the most young sailor round the world. In 2006, he challenged named 5 Oceans non-stop around alone the world running about 5600km. Handling 60 foot class1 boat, he got the 2nd position as the first Japanese in rough weather conditions. He is one of the popular Japanese top skippers. 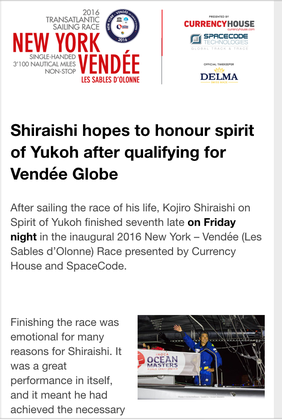 Few days ago, to reslize his dream in his long yachting life, Kojiro Shiraishi was in New York where was the start port for the final prerequisite race for the Vendee Globe. With his just bought new ship, he was preparing for the race in New York Harbor. Kojiro: The greatest race, that is my honor if I can join it. Every motivation comes from a curiosity, Kojiro said. In early childhood, he had a longing for the sea, and along with some failures, he challenged around alone the world yachting races as three times and completed. During 2000 hours in a race, whether you had some moment to give up or not, we asked him. Kojiro: Usually, I have a sea sickness in a first half (unexpected answer,) not every thing goes toward the happy, I'm patient with sufferings, for example in a trable, however, going with the subject instead doing with nothing, it is comfortable. and collisions, flying fishs are diving in a boat, twiters there are, strongest winds, icebergs also. Every time is under an exploration." In the vendee Globe Race, his buddy is the IMOCA60 boat Spirit of Yukoh, named according to his mentor Yukoh Tada. All sheets are centered in the cockpit to be able to make the skipper to handle the boat with one man operations. Kojiro: Usually, this size yacht will be helmed with 12~13 more crews, instead, in this case, we are going with a solo. This boat is an elder ship, however, several prominent skippers helmed, so the boat is a legend boat. I feel the boat pulled me to her. The inside of the racing boat is simple. There are a talisman, a shinto altar and a transmitter with GPS, and medical stuffs as a necessity including painkillers and a surgery operation pack. Kojiro: In case of an accident, take a picture and send it to the doctor in HQ in Paris, and make an operation by ourself according to the doctor's direction. In a real case, some one sewed his tongue by himself with the direction from the doctor. His tongue was cut with an ocean wave impact. We can't depend on anyone in oceans. No one can help us without ourself, it needs three days to get the rescue. The yacht Race, that is going into the oceans and competing with such hard conditions. Are there some mysterious things you have met? Kojiro answers this question, " There are many wonders in the nature as suddenly sparking in a sea, twinkling at the top of mast, and all sky being bright. Human knew a few things in the nature. We have to have the nature." His motto is "Ten nyo sui"(天女水) meening "the Sky like a Water," with flexibility and powerfulness as a water and to be covering the Sky of the earth integrally. After this interview, on the prerequisite race for the Vendee Globe race, Kojiro Shiraishi set off to France and 12 days later, he got a 7th position with complete running and qualified. 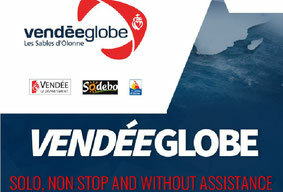 The Vendee Globe will be held on November. Kojiro Shiraishi's latest message (June 12)after the race has been translated. Please read his own message in English clicking on a surface of a photo. Honour the Spirit of Yukoh, that is a Kojiro Shiraishi's first speech and be heartful, has been translated in Japanese. If you want to read an original article, please click on the photo. For the non-stop solo round the world race. I'm an Ocean Explorer, Kojiro Shiraishi. In this time I am aiming at joining the Vendee Globe 2016~2017 in this autumn with this IMOCA60, a very big boat I ever got. I will challenge myself to the non-stop solo round the world race with this boat. For this aim, I need to equip new sails. I got a very boat but not had enough equipments including sails. For a solo racing, it's very important how sails have a good performance. Every thing depends on them. A sail is an engine as a car, so I have to have a good engine. Unfortunately, I short very sails. This time, I'm the First Asian to join the Vendee Globe and I want to raise the Japanee flag at the center of the special village set up on the Vendee Globe Esplanade at Les Sables d'Olonne. For this aim, I should have good sails. I and our team need your supports to get very sails. 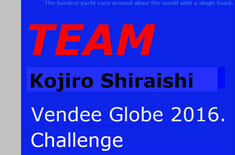 Please support our TEAM Kojiro Shiraishi Vendee Globe 2016~2017 Challenge. May 28. 2016 at New York North Cove Marina. Kojiro Shiraishi with Alex Thomson. He was the skipper of former Hugo Boss as current Spirit of Yukoh of Shiraishi. He join the race in this time with new Hugo Boss with foils. Good day !! Everybody of my supporters, I and Gilles arrived at AMERICA safely. Here is New Port. In this case, our sailing was just only for a deriverly the ship form France to New Port USA. However, it's too much tough because of all electricity out. Like a navi light and a navigation equipment ,everything which uses electricity we couldn't use except a few minutes with a small battery. We, I and Gilles handled steerings for twelve hours alternately. Under this condition, we crossed an Atrantic Ocean, so this sailing put us the power like a young age I was without useful equipments. We will reinforce our ship here, and challenge to New York Vendee (Les Sables d'Olonne). We couldn't comunicate with you under no erectricity, in the race I will keep comunication with you uplodeing comments, so please keep your support for us. We are well condition. Thank you very much and appreciate for yous supports. as of May.20 2016 in New Poer USA. Kojiro Shiraishi's Message for Kumamoto disaster. From Concarneau in France. Apr.20 2016. 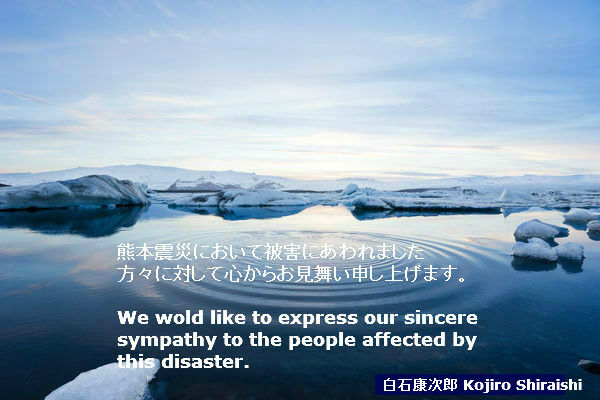 I, Kojiro Shiraishi expressed my sincere sympathy to the people affected by this Kumamoto disaster and condolences to the families of the victim. I'm staying in Concarneau now so I couldn't view and hear a detail around current situations, but also my offshore crews are worrying about Kumamoto. I'm able to only watch with Internet information, however, I'm sincerely anxious for the Kumamoto people. My sword is from Higo (old name of Kumamoto.) I have personal relations with Kumamoto. I expect Kumamoto's people will move up your own powers and go throuh this tough situation.